You've decided that Inbound Marketing makes sense for your business. Good choice. There are hundreds of thousands of businesses (and buyers) that agree with you! But do you know where to begin? Do you know if your website is ready for inbound? 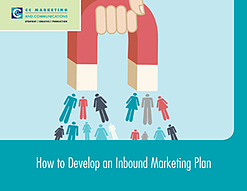 To ensure success, this e-book details the steps to developing an Inbound Marketing Plan. From defining your Buyer Persona and creating your list of keywords to choosing your platform, this e-book explains what steps to take and why they are integral to an Inbound Marketing plan. In addition, we include links to tools to help you manage your plan. Download How to Develop an Inbound Marketing Plan today! © Copyright 2019 CC Marketing and Communications, all rights reserved.